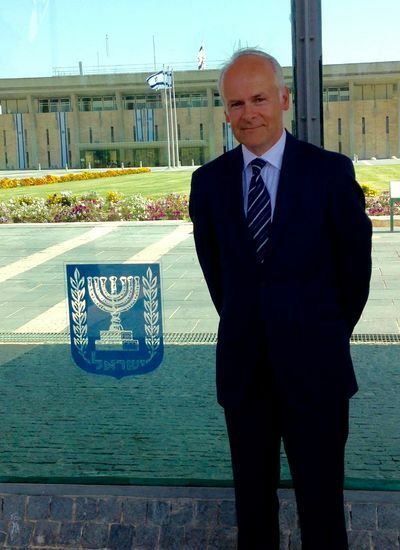 Tomas Sandell is the foremost Christian spokesman for Israel in Europe. Respected and appreciated, and even feared, in the corridors of power in Brussels. And now also in the United Nations Headquarters in New York. The mild-spoken Finn has an uncompromising message. Jan-Aage Torp was asked to make an exclusive interview with Tomas Sandell for the Norwegian-language Norge Idag, which is Norway´s largest evangelical newspaper. By special permission, we are presenting an adapted version of the interview in English. 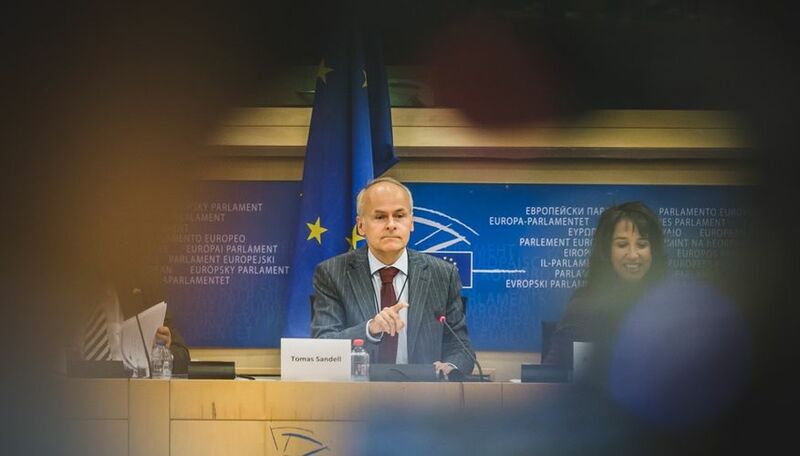 For 12 years, the Swedish-speaking and unassuming Finn, Tomas Sandell, has commuted almost weekly between his home in Helsinki and his office in the EU capital city, Brussels. 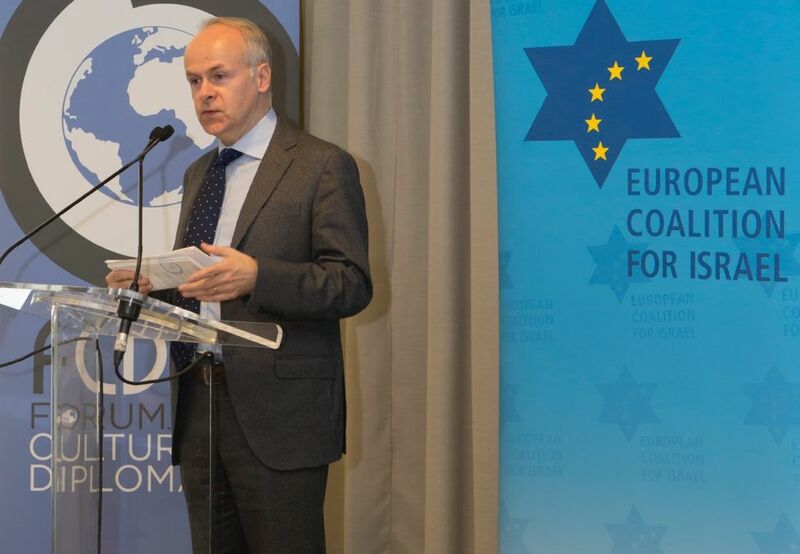 As founder and director of European Coalition for Israel (ECI), he has ensured that the Jewish people and the State of Israel is being imprinted into the consciousness of EU´s Council of Ministers, the Commission, and the Parliament, as well as in European capital cities. For some years, his work place has become increasingly global with frequent appearances in the UN-system in New York. - What has ECI achieved? - The greatest accomplishment is that we exist, and that we have open doors and communication channels in Brussels, New York. and at national levels in many important nations. Lately we utilized this when we within 48 hours were able to mobilize our contacts in over 20 of EU´s member states to reach the foreign ministers of the member states with an open letter about the weaknesses in the EU directive to label Israeli goods from the disputed territories. 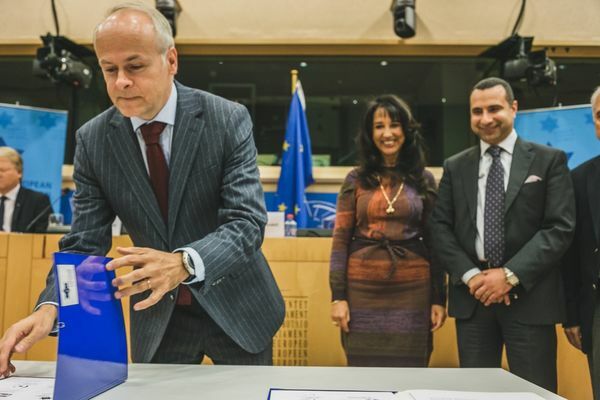 - In 2005, ECI Initiated and hosted the first International Holocaust Remembrance Day in the European Parliament in Brussels which has become an official EU Memorial Day. - During the same time we participated in the questioning of EU´s support of the Palestinian Authority which had as result that the EU for the first time ever froze the EU financial support to PLO. - ECI was the organization which rediscovered the San Remo Agreement from 1920 as the basis pertaining to international law for the State of Israel. We have been able to present this to national parliaments from London to Tokyo, as well as to ambassadors in the UN Security Council in New York. - One of the most recent victories is even the initiative to declare Yom Kippur as an official holiday in UN. This started as a vision three years ago, but was decided by the UN in New York just before Christmas. - For a long time we thought that our work per definition was limited to the EU and Europe, but when we discovered the significance of the San Remo Agreement, then we realized that these issues cannot be limited to nations or to a particular continent, but it is about the whole world. 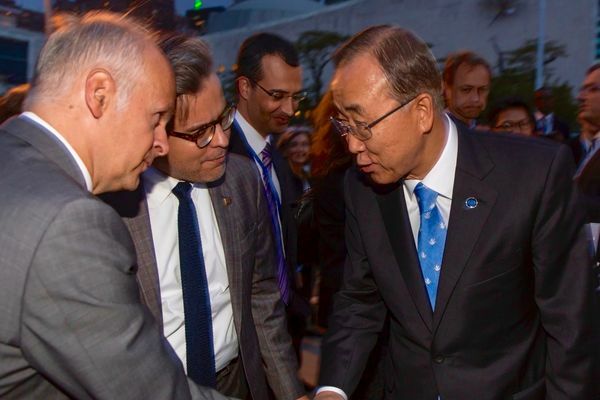 Then we even started our UN work Forum for Cultural Diplomacy which culminated in September in the big reconciliation ceremony Tashlich in the UN headuarters where the UN Secretary General Ban Ki-moon participated. - During the past three years we have met more than 70 different UN embassies to discuss how one can strengthen Israel´s position within the UN. Our agenda in the UN is a positive and "soft diplomacy»-agenda where we concentrate on Israel´s and the Jewish people´s many contributions to humanity, derived from the Peace Vision in Isaiah 2 ("they shall beat their swords into plowshares"), for new technologies and innovations that rescue lives around the world. When diplomats realize that there is an Israel beyond the political conflict, then they get interested and want to know more. In this way we have been able to have more than 50 UN ambassadors in attendance at our gatherings in spite of the fact that there are only around seven nations in the UN General Assembly that always support Israel. - Does ECI have a global agenda? Through our example in Europe we have even succeeded in inspiring nations on other continents to act in similar ways. Today we are close to several governments outside Europe that we assist with background material. Some continents are even interested in connecting with our work. - Europe has always had a leadership function among the nations, sometimes a blessing, but also sometimes a curse. If evil came from Europe 75 years ago through Nazi-Germany, then we want today that a work that intends to assist and support Israel may come from Europe. That is called «redemption». - How do you assess the support in various camps of "replacement theology" in these days? - ECI is not a theological organization but rather a Chistian human rights organization which desires to do what Christians should have done 75 years ago: To speak against the hatred of Jews and rescue them fom the death camps. - In most camps where there is revival and people that pray, read the Bible and are involved in mission, there is interest in and support for Israel. This is growing every single day, especially when more and more Christians discover that Israel´s enemies are also the enemies of Christians. - After the establishment of the State of Israel, the whole Middle East was cleansed of Jews who either had to flee or meet the sword. Today, that is the fate of the old Christian communities in the region, and Christians and Jews learn to stand together - for religious freedom and the most fundamental human rights. 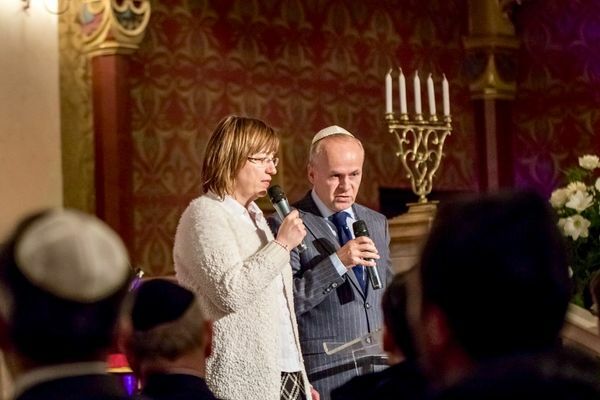 - Last year we presented a united appeal to the EU from Jewish and Christian groups in Europe in that we understood that these forces are threathening us all. - How well do you communicate with the Jewish communities in Europe and globally? - It is unnecessary to say that there is a deep appreciation within the Jewish communities around the world and from the State of Israel. In December I was invited to a Hanukkah celebration in New York by the President of the State of Israel, Reuven Rivlin; their permanent representative for Israel to UN, Danny Danon; and the President of the World Jewish Congress, Ronald Lauder. It was a very special occasion, and it felt like family, because Jews and Christians ARE family! - The link with the Christian fellowship is crucial. We want to be the voice for the Bible-believing Church in these institutions, and we need their support in prayer and financial backing. - What is your strength in the work for Israel? Weakness? - Our strength in ECI is that we have succeeded in being taken seriously by the political decision makers. Instead of "preaching to the choir», we have the opportunity to discuss with and influence the most central decision makers in the Middle East issue, both in Brussels and several national capital cities, as well as at the UN-level in New York. The weakness in this is simultaneously that we are not sufficiently visible in Christian circles, which also means that our finances are not as strong as if we exclusively had held Israel-meetings in the churches. But our calling is not the churches, but governments and international organizations such as EU and UN where the future of Israel is decided. - Some words on your ECI-team…. - We have a small but effective team of professional lawyers that draws up statements and the basis in difficult issues which we thereafter share with key decision makers. Our Chief Legal Counsel has his law degree from Oxford University and a long career as international attorney before he decided to give his competency to the Lord and Israel. Our fellow associate in Paris worked previously at a high level in the former French government. Our associate in charge of the work at UN is a mathematics professor from France who today knows the UN-system at least as well as the UN-diplomats. We are not more than five who work with this more or less full time, but we are supported by a large number of volunteers, often with a magnificent education and competency. If we want to be taken seriously, then we must learn to utilize other reasons than the Biblical reasonings when we state our case. - You are a real family man. Tell us about your priorities, and which value you place on your marriage and family. - I learned at an early stage that "ministry" must not be the most important thing. First comes the Lord, and then the family, and as No. 3 comes our "ministry" for the Lord. It is not always easy to practice what you preach with 130 days a year on the road, but I believe that my family, my wife, and our two kids understand that this is the way I think and prioritize. I also believet that there is a special grace for the families where daddy is called to travel, but at the same time we have a big responsibility to not abuse this grace and trust. This is one of my continuous prayers. - When did you experience your first calling into the ministry, and how did it happen? - My first experience of a calling came during my study years when I realized that my fellow-students and my sporting friends would one day become leaders in society. 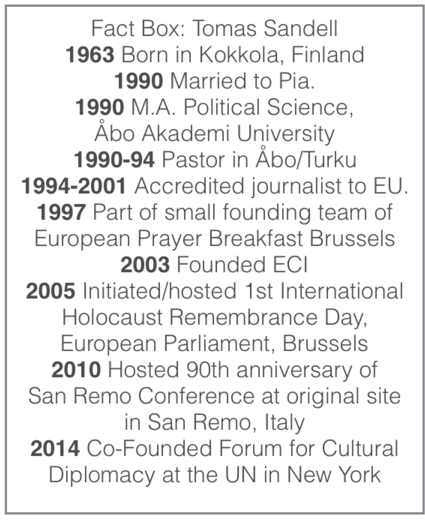 This became very evident when I discovered that one of our presidents, Mauno Koivisto, had studied at our faculty. If we want to influence our nation´s future, it is necessary to even influence young people during their study days in a time of their lives when they still may be shaped. For this reason, my wife-to-be Pia and I started a special group that we called "Faith at SF". SF was the name of the faculty where we studied, the Political Science Faculty at the Åbo Akademi in Åbo/Turku (Åbo is the Swedish name), Finland. - You started early in the 1990´s as a lobbyist in Brussels. How did that happen? - When did your love relationship with Israel start? What happened? - The understanding on Israel had always been in my home when I grew up as a natural part of the Christian faith, but for a long time it was a latent understanding, and not visible in my life and ministry. 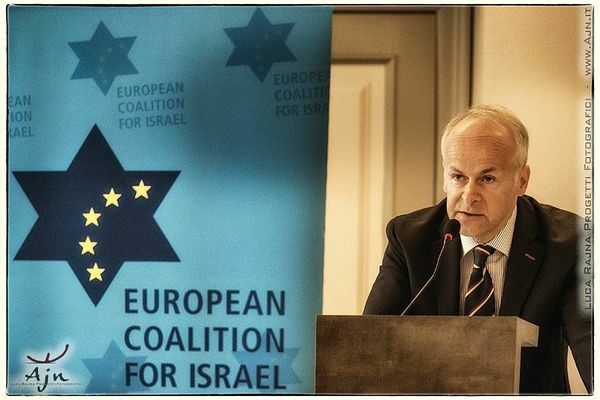 It was only after we had moved back from Brussels to Helsinki at the beginning of the 2000´s that we understood that there would be a new assignment in my life and that Israel would become the main track. 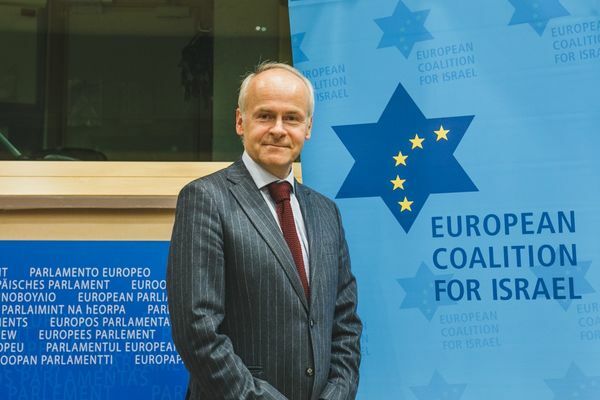 - During the years in Brussels I had noticed that nobody dared to stand up for Israel, not even the Christian organizations that were represented there. At the same time, antisemitism was on the rise in Europe, and the hatred and contampt for Israel. - How was ECI established? - - Suddenly I understood that I was called to become a voice for Israel in these circles where they did not have anyone else to stand up for them. - When Elie Wiesel spoke at a crisis conference in Brussels, he wondered why - one generation after Holocaust - there were nobody other than the Jews themselves who protested against antisemitism, and he asked "where are all the others?» Then I understood that my task is to convene "a coalition of all the others" This became after some time "European Coalition for Israel".